This chest x-ray shows adenocarcinoma of the lung. 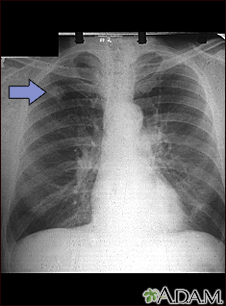 There is a rounded light spot in the right upper lung (left side of the picture) at the level of the second rib. The light spot has irregular and poorly defined borders and is not uniform in density. Diseases that may cause this type of x-ray result would be tuberculous or fungal granuloma, and malignant or benign tumors.